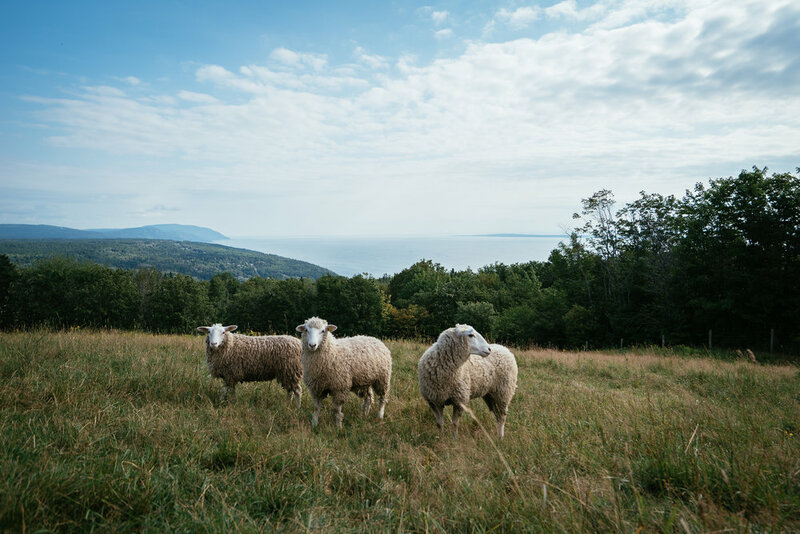 The Ferme des Quatre-Temps produces vegetables, grass fed beef, pastured chickens and forest pastured pork, veal and lamb from salted meadows and free-range, pastured egg. 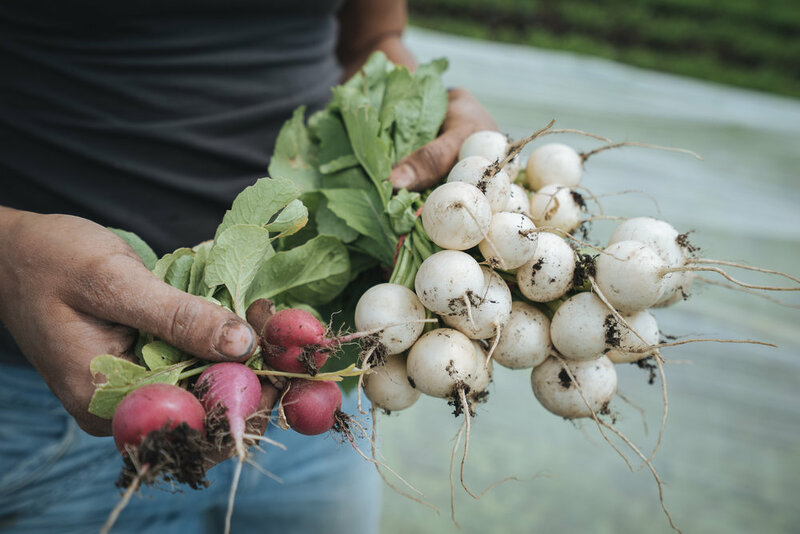 We cultivate more than 40 different vegetables on 8.5 acres according to the principles of biointensive agriculture, providing increased yields on small surfaces. This is made possible by taking inspiration from intelligent farm designs, appropriate technology (often low-tech) and soil microbiology used in synergy with processes of nature. 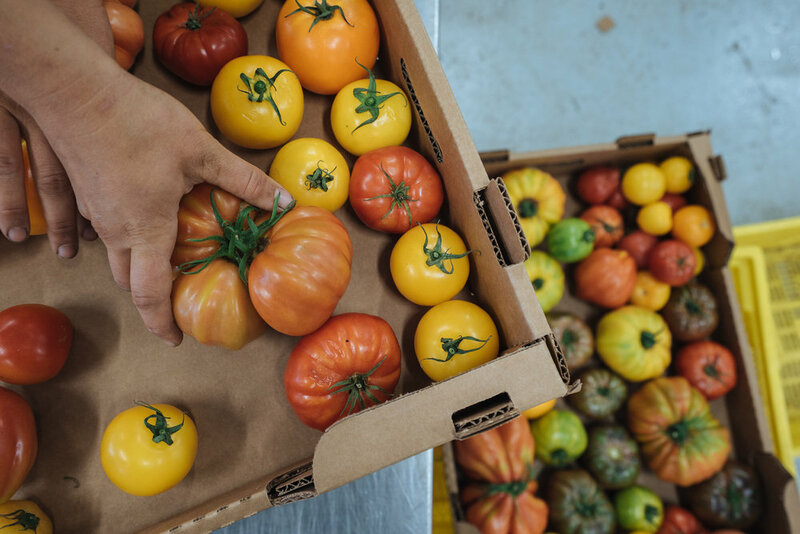 The care given to every aspect of vegetable production gives our vegetables exceptional flavours, colours and textures, as well as offering an unmatched variety. At La Ferme des Quatre-Temps we raise Belted Galloway and Wagyu crossed beef. Our herd is pastured in the summer on sixty acres of land, eating nothing but grass; while in the winter our animals eat high quality hay from a local, organic farmer. Our products are exempt of chemical pesticides, growth-promoting hormones and antibiotics. Additionally, all of our beef is dry-aged a minimum of 45 days, resulting in a premium quality meat with incredible tenderness and amazing flavour. 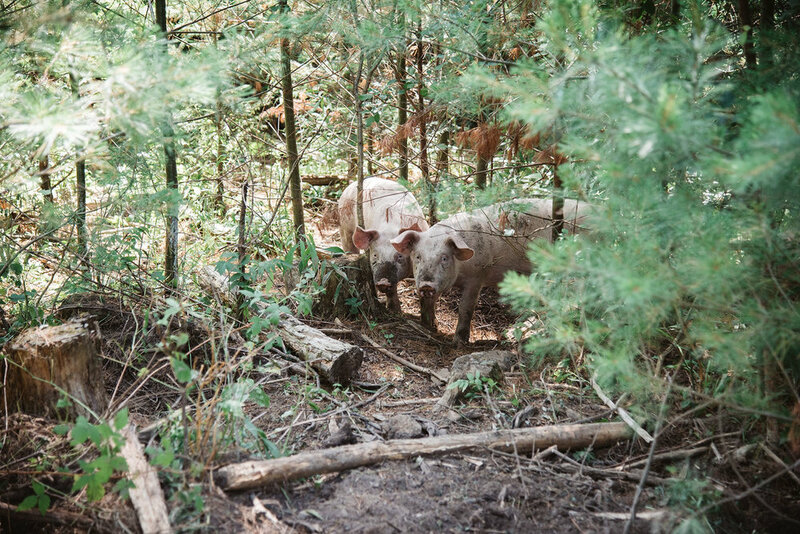 At La Ferme des Quatre-Temps we raise pigs in our surrounding forests, with the utmost respect. Pigs thrive in this environment and forage fallen fruits, ferns and roots. They are also fed a mixture of organic grains and leftover vegetables from our gardens. The time spent outdoors scavenging on a variety of items enhances the flavour, texture and colour of the meat. La Ferme des Quatre-Temps is home to a variety of chickens. Moved on a daily basis to a fresh pasture, our chickens have access to fresh air, sunshine and all the grass they require. To supplement their diet our chickens are also fed a mixture of organic grains and have access to plentiful amounts of fresh water. Pastured chickens lead to a high quality meat as they eat grasses that contain Vitamin A and Omega-3 fatty acids. We raise happy hens on our pastures, which produce large, brown eggs. During the summer, their mobile henhouses are moved daily providing top quality fresh grass, which also fertilizes our fields. In winter, they live inside a greenhouse and enjoy a profusion of fresh air and sunlight. Since they are also fed a blend of organic grains and vegetables from the gardens, the quality of their eggs is extraordinary. With their bright orange yolks, our farm eggs have a creamy texture and an incredibly rich taste. Copyright © 2017 Ferme des Quatre-Temps All rights reserved.